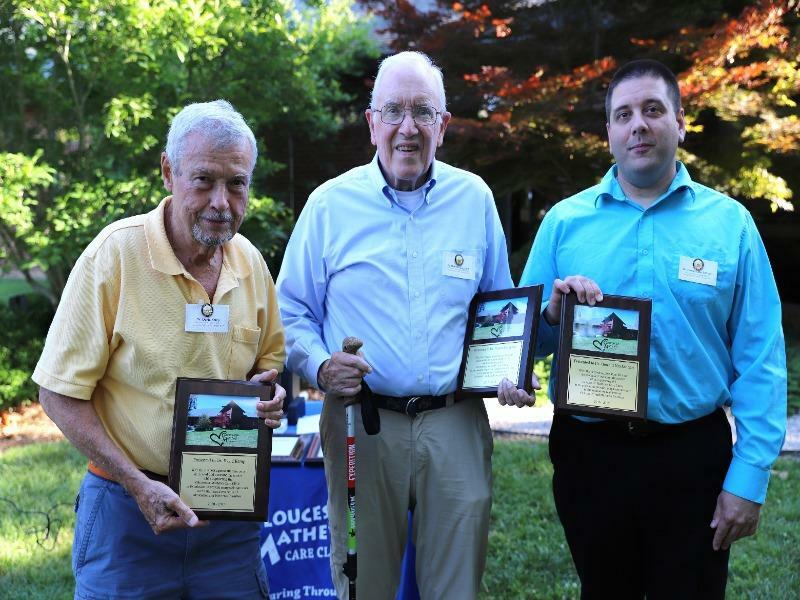 The staff & Board of the Gloucester Mathews Care Clinic took time out on June 5th to thank the Clinic’s many volunteers for their service at the organization’s annual Volunteer Appreciation Picnic. Each volunteer received a “Volunteers Are the Heart of our Team” pin, and volunteers who have given twenty years of service were recognized. 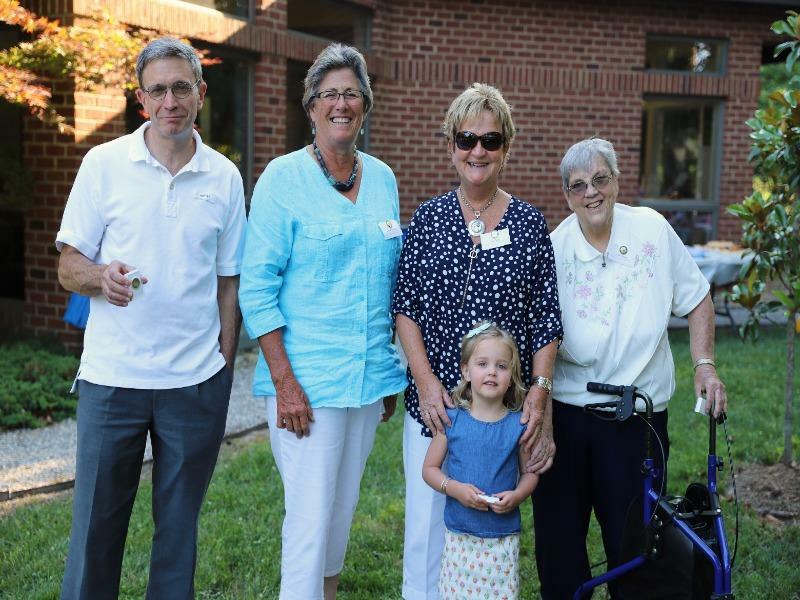 The staff & Board of the Gloucester Mathews Care Clinic took time out on June 5th to thank the Clinic’s many volunteers for their service at the organization’s annual Volunteer Appreciation Picnic. Each volunteer received a “Volunteers Are the Heart of our Team” pin, and volunteers who have given twenty years of service were recognized. 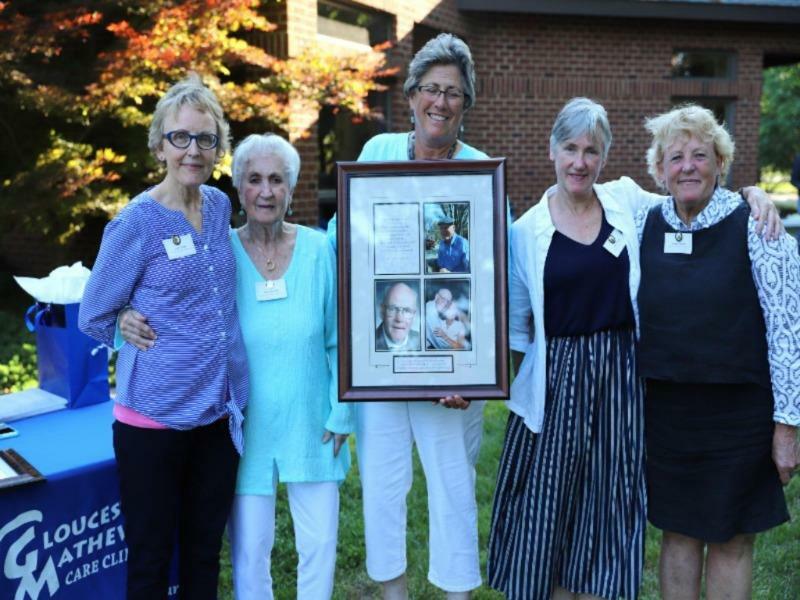 Director of Volunteer Resources Jayme Sweten and Board President Louise Theberge also honored those volunteer physicians who have retired or moved away from the Clinic. Finally, Sweten and Theberge honored the late Dr. John Quarles for 10 years of volunteer service to the Clinic, and presented a beautiful framed remembrance which will hang in the Clinic in his honor. Quarles photo: Betty Quarles and her daughters attended and were honored with a remembrance of Dr. John Quarles’ volunteer service. Pictured (L-R): Lorie Jones, Mrs. Betty Quarles, Louise Theberge (GMCC Board President), Jeanne Brooks and Margie Stinson. The Mathews Community Foundation awarded $112,942 in community grants to local nonprofits and organizations at its annual grants reception, which was held last Wednesday at Kingston Parish House. “This event is the highlight of the foundation’s year. It is the opportunity to affirm our commitment to improve the quality of life for those living and working in Mathews,” board chair Reed Lawson said. “Community grants are awarded to impactful programs and projects working toward collective goals MCF awards $112,000+ in 2017 grants around health and wellness, educational success, cultural vibrancy and economic prosperity,” said MCF Grants Committee chair Anne Leddy. “This year the foundation awarded 83 percent of total requests received, with threequarters of the funding from the Mathews Community Foundation Endowment. This fund has grown from the support of hundreds of county residents and provides flexibility in responding to changing and emerging needs,” said Leddy. In the area of cultural vibrancy, grants focused on programs and projects that allow community members the access to and appreciation for arts and cultural opportunities, including arts education and historic/cultural preservation. Recipients included the Court House Players, Bayside Youth Ballet, The Fairfield Foundation, Bay School Community Arts Center, and Concerts by the Bay. Economic prosperity grantmaking supports programs which sustain the region’s natural resources, and focus on ensuring all residents have the skills and resources to access career opportunities. Grantees included Coastal Virginia Wildlife Observatory and VersAbility Resources. With focus on the youngest Mathews residents, Educational Success grants support programs that support students academically and socially throughout their educational experience, including both in- and out-of-school time. Grants were awarded to the Mathews Boys & Girls Club and Jacob’s Ladder, and to support the Mathews County Public Schools, including support for the Mathews Parent Resource Center, the Mathews High School Robotics Team, Nature Camp for Thomas Hunter Middle School students, the Mathews Continentals Society, MHS Marching Band, MHS Freshman Transition Fair, and expansion of MHS tech/training labs. Over half of grantmaking in 2017 focused grants to organizations connecting residents with resources that meet their health, nutritional and safety needs. Grantees include the Alzheimer’s Association, Bay Aging, Gloucester-Mathews Care Clinic, Hands Across Mathews, Mathews County Triad, Mathews Department of Social Services, Mathews Family YMCA, Mathews Volunteer Rescue Squad, and Partners for Mathews Students. Established in 1999, Mathews Community Foundation, an affiliate of The Community Foundation Serving Richmond and Central Virginia, ensures the legacy and charitable intent of its donors through a focused grantmaking process. “The grants committee and advisory board members work diligently to align funds that contribute to community grantmaking with the goals of a program or project, while addressing the changing needs of our community. The foundation serves and inspires people to build philanthropy for our region and to engage in our community,” Lawson said. If you are interested in learning more about establishing your charitable legacy or how to partner in community grantmaking, contact Regional Director Margaret Nost at 804-725-3454 or mnost@tcfrichmond.org. For questions about the community grantmaking program, contact Leslie Franklin, Regional Grants Management Officer, lfranklin@tcfrichmond.org. Photo: Mathews Community Foundation grantees of 2017 gathered for a photo at the conclusion of last week’s program. They are, front row from left, Bella Baucom, Lauren Quezada, Eric Pagan, Davis Dowdy, John Hamilton, Clifford Hamilton, Bill Higdon, and Bill Burry of MHS Robotics; second row, Aubrey Hall (Jacob’s Ladder), Judy Rowe (Bayside Youth Ballet), Kristina Watkins (MHS Band), Tiffany Gordon (Mathews DSS), Jean Duggan (Bay Aging), Wilnet Willis (Continentals Society), Sheila Pillath (Mathews Family YMCA), Ashley McCuistion (Fairfield Foundation), Dave Burns (Gloucester-Mathews Care Clinic), Jerry Twigg (VersAbility Resources), Chris Burry (MHS Robotics), Karen Hutchens (Court House Players); third row, Toni Childress (Mathews High School), Andy Hawkins (Coastal Virginia Wildlife Observatory), Christine Johnson (Mathews Family YMCA), Barbara Ettner (Mathews Parent Resource Center), Phyllis Hudgins and Jack Cranford (Mathews Triad), Helen Yacobucci (Partners for Mathews Students), Larry Brown (MHS Robotics); back row, Marilyn Tucker (Concerts by the Bay), Pam Doss (Bay School Community Art Center), Angela Sale (Mathews Boys & Girls Club) and Dan Hill (Mathews Volunteer Rescue Squad). Also receiving grants but not pictured are Jerry Ligon (Thomas Hunter Middle School), Bill and Georgiana Simmons (Hands Across Mathews) and Ellie Galloway (Alzheimer’s Association). The Mathews Foundation has announced grant recipients for its Spring 2016 funding cycle. These grants were made with the following goals in mind — our community offers a path to economic prosperity; it is a place where young people experience educational success; a community that prioritizes health and wellness; and a region that is renowned for its cultural vibrancy. The Mathews Community Foundation (MCF) Grantee Reception was held on Wednesday, May 25. Reed Lawson, MCF chair, began the awards by thanking those present: donors, non-profit organizations and business partners, all of whom work together to improve the quality of life in Mathews. It was noted that $84,500 in grants would be awarded during the afternoon reception. Following Reed’s introduction, the grant awards began. Charlotte Martin, head of the Grants Committee, explained that grants were awarded in four main areas: health and wellness, educational success, cultural vibrancy and economic prosperity. Nearly 50% of grants in 2016 focused on health and wellness. Grants were awarded to the Alzheimer’s Association, Bay Aging, Gloucester Mathews Care Clinic, Hands Across Mathews, Mathews County TRIAD, Mathews Family YMCA, Mathews Volunteer Rescue Squad, and Partners for Mathews Students. Educational success awards focused on helping children achieve and learn. Grants included support for Jacob’s Ladder, Mathews Boys & Girls Club, and Mathews County 4-H. Grants awarded to Mathews County Public Schools included support for the Junior Beta Club, Parent Resource Center, Mathews High School Robotics Team, Nature Camp, and partnership with the Mathews Continentals Society. Cultural vibrancy grants focused on the arts. Recipients included Bay School Community Arts Center, Concerts by the Bay, The Court House Players, and The Virginia Symphony Orchestra. Economic prosperity grants centered on economic and environmental programs. Grants were awarded to VersAbility Resources, Coastal Virginia Wildlife Observatory and Friends of the Tiger Beetle and Chesapeake Bay Habitat Foundation. In 2016, grants from Mathews Community Foundation have provided opportunities for local youth to learn water safety, become stronger swimmers, and be exposed to local and state-wide environmental conservation efforts. 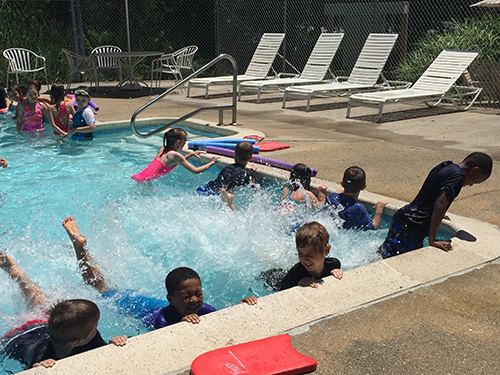 For the first time in 2015, the Mathews Family YMCA provided the opportunity for all second graders at Lee Jackson Elementary School to participate in swimming lessons and water safety programming, at no cost, through the “Second Grade Learn to Swim” program. Over 90% of all second graders participated, reaching nearly 80 youth. Building on the success of year one, the YMCA received a second grant award in 2016 and again had 90% of all second graders participate. “Despite work and play that abounds on the 200+ miles of coastline in Mathews County, many of our youth lack swim and water safety skills to keep them safe on the waters that provide their livelihood and recreation,” said Mathews YMCA Branch Director Sheila Pillath. 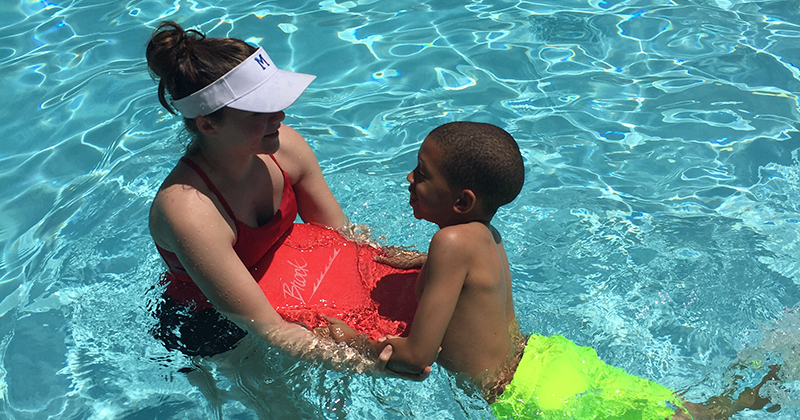 “In addition to providing a lifelong skill, swim lessons also enable participants to stay active, setting healthy habits that can last a lifetime.” The YMCA continues to provide leveled swimming lessons each summer to nearly 100 children ages 3-12 by certified (and fun) instructors. In addition to swimming, grants provided hands-on opportunities for Mathews youth in local and state-wide conservation efforts. Thomas Hunter Middle School students received scholarships to attend Nature Camp located in the Blue Ridge Mountains. The camp specializes in natural history and environmental science education. For many years, THMS students have had the opportunity to attend the week-long camp and return to Mathews as stronger, responsible stewards of our natural resources. 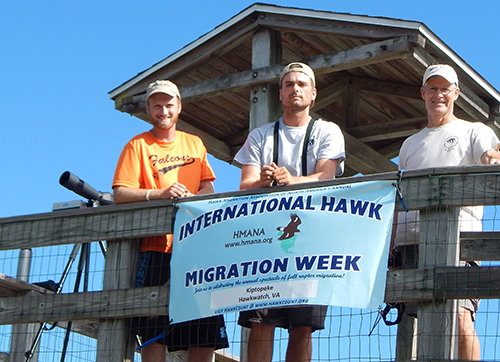 The Mary Watt Pulley Wildlife Preservation Fund provided support to Coastal Virginia Wildlife Observatory for the seasonal Hawkwatch position in Kiptopeke State Park. In its 40th season, data collection and educational presentations remain the primary focus of the program during the three-month migration period. On Earth Day, volunteers from the Friends of the Tiger Beetle and Chesapeake Bay Habitat Foundation hosted 75 seventh grade students on Bavon Beach for an interactive, hands-on day. This grant-funded opportunity provided a local connection to conservation and beach restoration, including presentations from the US Fish and Wildlife Service on the threatened Tiger Beetle population and VIMS (Virginia Institute for Marine Science) on shoreline erosion. Each student participated in planting grasses along the shore to promote growth of a new dune system. The foundation remains committed to impactful educational and health opportunities for Mathews youth, and is proud to partner with nonprofits such as the Mathews Family YMCA, Coastal Virginia Wildlife Observatory, and Friends of the Tiger Beetle and Chesapeake Bay Habitat Foundation, and the continued partnership with Mathews County Public Schools. The devastation of the 2017 hurricane season is far-reaching, with catastrophic flooding in Southeast Texas to battered towns across Florida. Lives and communities are forever changed. While rescue efforts and emergency response are underway, we know from past disasters that recovery efforts will span years. If you would like to support response and recovery efforts, we have compiled a list of trusted partners who will put your resources to work in the areas that need it most. Emergency response addresses immediate needs like food, water and medical care. American Red Cross – The agency is on the ground to provide shelter, ready-to-eat meals, comfort kits, cleaning supplies and blood supply to those affected by the storm. Salvation Army – The Salvation Army has deployed mobile kitchens and food boxes to help feed storm victims and first responders. They are working closely with state and local emergency management officials and positioning disaster leadership teams across the disaster zone. Tips for Volunteers - Our partner organization, HandsOn Greater Richmond, posted information to help guide individuals on the best ways to respond in a disaster. Click on the link for more details. Recovery efforts not only address needs that emerge once news coverage wanes, such as safe drinking water and transitional shelter, but also long-term initiatives that address chronic social and environmental challenges. Hurricane Harvey Relief Fund at the Greater Houston Community Foundation – Houston Mayor Sylvester Turner established the fund in partnership with the Foundation to support immediate and longer-term recovery efforts in the Greater Houston region. If you have ties to another town affected by the storm, we can help connect you to the community foundation serving that area. CDP Hurricane Harvey Recovery Fund and CDP Hurricane Irma Harvey Recovery Fund at the Center for Disaster Philanthropy – These funds are designed to meet the needs that emerge over the weeks and months to come, and to fill gaps where public resources are unavailable or scarce. The CDP is a full-time resource to help donors make more thoughtful disaster-relief giving decisions and maximize the impact of their gift. Natural disasters often lead to independent or fraudulent fundraising efforts. Please do not hesitate to contact a member of our Philanthropic Services team at 804-330-7400 if you wish to discuss a particular donation or grant recommendation. The Mathews Community Foundation (MCF), which was founded in 1999 by a small group of citizens, has announced 33 grants totaling $131,934 for local non-profit, and programs in the Mathews County schools. The grants are focused in four areas: economic prosperity, educational success, health and wellness and cultural vibrancy. An awards ceremony was held at Kingston Parish Hall on Wednesday evening, May 30 honoring this years grantees. The grants are awarded through a public application and a board level review process that is announced every spring. A total of $277,800 was requested by local non-profits this year, which reflects the level of needs in the region, but all available funds were awarded to those chosen through this process. The mission of the MCF is to improve the quality of life for those living and working in Mathews, by encouraging local philanthropy, establishing and maintaining endowment funds, and providing donors a way to create enduring charitable funds that reflect their priorities, and creating grants that meet changing community needs. Donors may establish funds with a specific purpose, or for general charitable causes. The MCF is one of three affiliates supported by The Community Foundation serving Richmond and Central Virginia. The assets are managed for maximum return and capital preservation so that grants can be given on a continuing basis in perpetuity, or in which the donor may wish. Hands Across Mathews Interfaith Council Inc.